Get all those cables, decorations and gardening tools off your garage floor and into NewAge' newly redesigned, Performance 2.0 Series modular garage cabinetry. These cabinets are built to last with their fully welded, 24-Gauge steel frames and fully lockable, double walled doors. Our configured sets are shipped with adjustable steel shelving; easy-to-grab stainless steel handles and height adjustable leveling legs that accommodate uneven garage flooring. The manufacturer's limited lifetime warranty gives you the insurance that your cabinets will look great for years. This sleek looking heavy-duty all black 9-drawer tool chest & cabinet is the ultimate in storage. The chest and cabinet is made from high grade all welded steel construction and finished with tough industrial powder coat paint. Ball bearing drawer slides hold up to 50 lbs. while the 2 larger bottom drawers on the cabinet can support up to 100 lbs. Oversized full length aluminum drawer pulls make it easy for fingers of any size to open the drawers. Additional easy access storage space in the top till chest. The reinforced top lid is supported by gas struts. The aluminum recessed side handles make it easy to lift and move the chest. The cabinet is supported by heavy Duty 5 in. x 2 in. casters, which rolls easily under heavy loads. Two swivel casters have toe brakes to keep the cabinet in place. 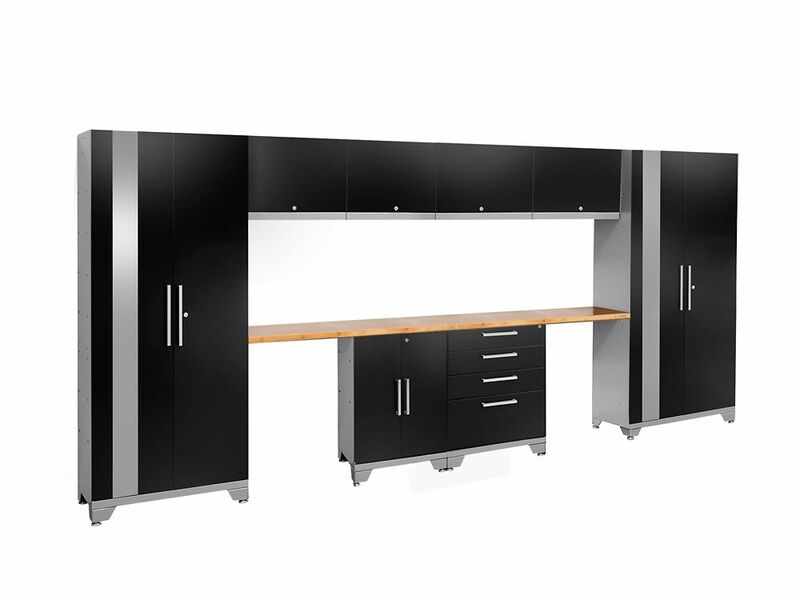 Designed to make a big statement, the Bold 3.0 Series cabinetry system will instantly upgrade the look of your garage or workshop and provide you with ample storage space for all your gear. Available in deep red, most cabinets come fully-welded, requiring minimal assembly and are ready to organize and transform any size of garage. Performance 2.0 72-inch H x 156-inch W x 18-inch D Garage Cabinet Set in Black (10-Piece) Get all those cables, decorations and gardening tools off your garage floor and into NewAge' newly redesigned, Performance 2.0 Series modular garage cabinetry. These cabinets are built to last with their fully welded, 24-Gauge steel frames and fully lockable, double walled doors. Our configured sets are shipped with adjustable steel shelving; easy-to-grab stainless steel handles and height adjustable leveling legs that accommodate uneven garage flooring. The manufacturer's limited lifetime warranty gives you the insurance that your cabinets will look great for years. Performance 2.0 72-inch H x 156-inch W x 18-inch D Garage Cabinet Set in Black (10-Piece) is rated 5.0 out of 5 by 1.